By Mary Carmichael and Stephanie EbbertDemocratic Senate candidate Elizabeth Warren acknowledged for the first time late Wednesday night that she told Harvard University and the University of Pennsylvania that she was Native American, but she continued to insist that race played no role in her recruitment. When the issue first surfaced last month, Warren said she only learned Harvard was claiming her as a minority when she read it in the Boston Herald.I'm glad we got this ridiculous "mystery" out of the way. Did two different schools just happen to read her "Native" listing in the professional directories? Or her Pow Wow Chow cookbook? And accept that she was Native unhesitatingly? Not even one little question about how she didn't look Native and could the listings possibly be mistaken? No, of course not. Penn and Harvard thought she was Native because she told them so. They reported this claim to the government as if it were fact. Warren claims she forgot that she told Harvard she was Native. Really? You forgot whether you told people you were white or Native? Did you also forget whether you told them you were male or female? Because that's about the same magnitude of error. But let's assume she did forget. The correct answer in her previous comments would've been "I don't remember what I told Harvard." Not "I never told Harvard I was Native." If you don't remember, you say "I'm not sure" or "I don't know." As I said before, the more she listed herself as "Cherokee" or "Native," the more she required evidence. Now we learn it was official. She helped her schools mislead the federal government on their diversity reports. She didn't say she was white with Native ancestry, which might've been accurate. She flatly said she was Native despite having no known tribal ancestors. Indeed, despite having nothing but unreliable family rumors. At a minimum, this listing let the schools deflect the hiring criticism they were receiving. They could say they had one "Native" professor so they didn't need to look for others. Consequently, did Native professors get less consideration for job openings? Quite possibly. Although there's still no evidence that Warren used her imagined ancestry to get a job, it's looking more and more like she engaged in box-checking to get ahead. She can't claim she told her schools she was Native to meet other Natives--her prior flimsy excuse. The only reason you inform officials you're a minority is to benefit from it--officially. 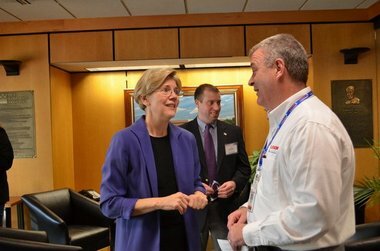 By Chris CillizzaElizabeth Warren’s acknowledgment Wednesday night that she had formally informed both Harvard University and the University of Pennsylvania that she was a Native American seemingly contradicts a month of the Massachusetts Democrat’s assertions on the matter and represents a major misstep for the nationally touted candidate. But, when the Boston Herald first reported on the fact that Warren was listed as a Native American in a faculty directory, she said that she had no previous knowledge of that fact and had not authorized Harvard to list her as a minority. Warren’s campaign has said she forgot some details of her past employment as a way to explain the discrepancy in her statements. While the Warren campaign will insist that she is being consistent—that she has always said that she never told Harvard or Penn about her heritage before being hired or that it benefited her in any way—the optics of this back and forth are just terrible for her. This could—and should—have been a minor nuisance for the campaign. No one is alleging that Warren used her minority status to get her jobs and it’s hard to imagine that in a campaign where the economy, jobs and debt are the overriding issues that whether Warren is Native American or not matters at all to voters. But, Warren has turned a minor nuisance into a major storyline by not simply coming out with everything she knew—up to and including that she had formally told Harvard and Penn of her Native American heritage—about the whole episode right from the start. By dragging out the story—the first Herald piece on it ran April 27!—Warren has turned it into, at the least, a distraction and, at the most, an issue to be used against her this fall.I was going to say the same thing myself. Horrible crisis management...as bad as it gets...an "F" grade. Pure idiocy to turn a minor story into a major one. This leads me to question her aptitude for politics. Not because of her questionable ancestry, which still isn't a decisive issue. Rather, because of her inability to manage this relatively simple controversy. If you don't understand public relations, I'm not sure you're qualified to hold public office. Politics is all about the art of the message. For more on Elizabeth Warren, see Cherokee Website Targets Warren and Harvard Reported Warren as Native. This controversy has been going on for a couple of weeks as the Winnemem Wintu beseeched the government to close the river for their ceremony. But the non-Indians' response to this sacred religious event makes it a pop-culture issue. By Marc DadiganSince 2005, the Winnemem Wintu, a deeply traditional tribe of 125, have struggled with the U.S. Forest Service to implement a mandatory closure of 400 yards of the McCloud Arm of Shasta Lake, a tiny corner of nearly 370 miles of shoreline for their young women’s Coming of Age ceremonies. The Forest Service can only close the river for a federally recognized tribe, according to federal law, and the Winnemem lost their recognition due to a bureaucratic error in the mid-1980s. “Voluntary closures” in the 2006 and 2010 ceremonies led to the tribe being harassed by recreational boaters. Feeling they had run out of options to get the river closure, the Winnemem Wintu held a War Dance May 24–27 at the Coming of Age Ceremony site where tribal activists, environmental justice activists and Occupy movement members helped the tribe enforce their own closure. Unfortunately, the euphoria from the closure quickly gave way to actions that have marred previous ceremonies at the site. On May 27, just as the tribe was about to complete their final dance of the ceremony, a fleet of seven motor boats and three jet skies motored back and forth through the ceremony site at speeds greater than the 5 mph speed limit, flipped off tribal members, stared down young women holding infants and did doughnuts near the tribe’s sacred sites. “It was pretty much about as racist as you can get without going to jail or being violent,” said 25-year-old Winnemem War Dancer Arron Sisk.Comment: Natives are 1% of the US population, so you close the river for three of 365 days to accommodate their religion? How is a compromise like that not fair to everyone? For more on Native religion, see Sacred White Buffalo Killed and Skinned, Eagle Killing Divides Tribes, and Christian Flyer Calls Lakota Rite "Satanic." By Michael BrennerOne reason for this feckless conduct is that the pronounced sense of American victimhood has powerfully strengthened American self-righteousness. We are as sure as we ever have been that we have a Providential mission on this earth, that we were born as a nation in a condition of "original virtue," that 9/11 was an offense against the natural order of things. That order must be restored--in our hearts, in our minds, in our spirit--by acting our there, not by looking inward. After all, Americans are a proactive, can-do people. Americans, more than most other peoples, live by their collective myths. American 'exceptionalism' in particular holds a key place in their make-up. That places an exceptional burden on preserving our foundation fables. The impulse to pursue real and imagined enemies across much of Eurasia and Africa is propelled in part by the fearful quest for absolute security that is taken as an American birthright. That impulse is reinforced by the imperative to validate the nation's mythical self-image. Atavistic beliefs that Americans are winners, that they act selflessly in the world, that this goodness should be recognized by others, that Truth is on their side--together form the keystone of American being and meaning. Individuals' sense of worth is tied to this mythologized collective identity. This makes it exceedingly difficult, psychologically, to cut loose from actions that failed the test of utility in meeting national interests years ago. For the dread of facing a reality bereft of the moral and ideational sustenance those myths provide is stronger than is the fear of costly wars without end and corrupted ideals. A mind shaped by feelings of dread, ingrained superiority and resentment is totally self-absorbed. It suffers from a lack of interest in the attitude of foreign parties--much less an ability to understand them. We launch ourselves into one audacious venture after another whose success supposedly depends on reorienting the thinking of the natives, of winning a battle for hearts and minds, for instilling new norms of behavior--all overlaid with respect for the United states. Yet we show little concern for finding out who these people are--much less adjusting our own actions accordingly. They are just 'they.' So we scold, we instruct, we insist--and we bribe. They resist, they fume, they ignore--and they pocket, sometimes. This is what Washington celebrates as "smart power." They suffer accordingly. We suffer their reaction--and from our incapacity to rethink what we are doing and why.Comment: Brennan wrote this primarily about Muslims, but it applies 100% to Indians. Indeed, we have 500 years of thinking about and treating Indians this way, as opposed to 10 (or 50 or 100, depending on when you start) for Muslims. As I've noted many times, we've defined ourselves as white Anglo-Saxon Protestants who "tamed the wilderness" for God. 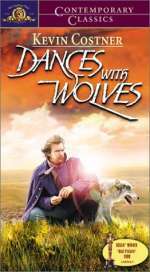 Taming the wilderness means taming the Indians; they're synonymous. It's George Zimmerman vs. Trayvon Martin on an international level. Zimmerman/America attacks, Martin/foreigners defend. Zimmerman/America imagines that Martin/foreigners are evil and kills them accordingly. Then Zimmerman/America declares itself the real victim even though it attacked first. For more on the subject, see "6 Ridiculous Lies" About Indians and Chomsky on Genocide Denial. Below: "How dare you threaten us with your heathen ways?!" By John Two-HawksLet's take a look at sports team names in general. There are only three categories that nearly all sports team names fall into. Eagles, Bears, Falcons, Lions, Tigers, Ravens, Bulls, Wolverines, Cardinals, Dolphins, Ducks, Jaguars etc. Pistons, Bullets, Rockets, Suns, Jets, Red Sox, White Sox, Stars, Rockies etc. Packers, Kings, Steelers, Spartans, Buccaneers, Vikings, 49ers, Cowboys, Rangers, Lakers etc. Obviously there are exceptions.And:[W]hich category do these so-called 'Indian' sports team names fit into? Animals? Objects? Professions? The answer of course, is simple, none of the above! These names/mascots fall into the category: RACIAL.Good analysis, although it's not quite right. Vikings and Spartans (along with Trojans, Fighting Irish, and a few others) are more properly classified as ethnic or political groups--like Indians. The main point with these groups is that they're predominantly gone, and thus not around to be offended. As for the Fighting Irish, I addressed that case in Fighting Sioux vs. Fighting Irish. One could argue that most people classify Indians with animals, not professions. People think they're fierce and predatory like animals. They wear skins and feathers like animals. They make sounds (chants) and movements (dances) like animals. Being Indian isn't a profession, obviously. If people thought it was, every Indian mascot wouldn't have a display of plumage like an exotic bird's. They could represent an Indian with an abstract logo like that of the Steelers or Saints. Fact is that people choose Indian mascots precisely so they can display a wild animal savage on their logos. That's why they bawl like babies when you let them keep a name such as "Warriors" without the Indian imagery. Why is the fact that Indians are a racial category a problem?These 'Indian' mascots/team names oppress Indian people. They oppress because they continue in the use of extreme negative stereotypical antics, words and images. Antics like the 'tomahawk-chop', mock 'Indian war-chants', non-Indians painting their faces and dressing-up like 'Indians', mascots performing mock 'Indian' dances or throwing fiery spears etc. Indian children cannot possibly look at a stadium full of thousands of people mocking their ethnicity and making fun of their traditions and feel good about being Indian. This is what 'Indian mascots' do. They glorify all the stupid old stereotypes and steal the pride our children could have in the beauty of their race. They insult the entire Indian race. This is a word that is commonly given as a nickname which insults Indian men. The cultural equivelant would be to nickname all white men 'Prez' or 'King'. The term 'chief' itself is incorrect. Our leaders were never 'chiefs', but headmen, or clan mothers, and so on. Not 'chiefs'. Our leaders were highly disrespected by the USA. So calling someone 'Chief', is just a way to continue that disrespect....Comment: For more on Indian mascots, see Hockey Team Chooses "Tomahawks" Name and Oregon Bans Indian Mascots. 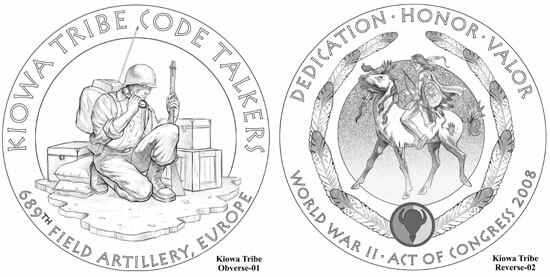 By Michael ZielinskiThe Commission of Fine Arts recently reviewed design candidates for Congressional Gold Medals which will be issued to recognize four Native American tribes whose members served as code talkers during World War I or World War II. In 2001, Navajo Code Talkers had been recognized with a Congressional Gold Medal for their contributions during World War II. Under the Code Talkers Recognition Act of 2008 (Public Law 110-420), there will be 22 additional tribes recognized. The gold medals shall be accepted and maintained by the Smithsonian Institution, which is encouraged to create a standing exhibit for Native American code talkers or Native American veterans. Silver duplicate medals will be awarded to members (or their next of kin or other personal representative) of the recognized Native American tribes who served in the Armed Forces as a code talker during any foreign conflict in which the United States was involved during the 20th century. Bronze duplicate medals may be struck and sold to the public.Comment: For more on the codetalkers, see Navajo Nation Code Talkers Week and Guitar Honors Navajo Codetalkers. Below: The Kiowa Tribe's medal design. By Andi MurphyAn associate professor from New Mexico State University had the moment of a lifetime several weeks ago in England. "I went to the Windsor Castle with those of us from the pageant to meet the queen," said Donald Pepion, 67, an anthropology professor, via email. "We had tea and crumpets." Pepion, a Blackfeet Native American originally from Montana, was with 10 other Native Americans from different Plains tribes selected to participate in the Queen's Diamond Jubilee Pageant, May 10 -13, on the grounds of Windsor Castle. It was his first trip to England. "Although I had many questions about the Native Americans' participation in the Queen of England's Diamond Jubilee Pageant, I was willing take advantage of an opportunity to share Native American culture," Pepion said. "Of course, my underlying passion as a horseman from a Montana ranch background lures me when I am invited to wear my traditional Blackfeet Indian regalia and ride a horse." Pepion's Blackfeet, or "Pikuini," name is "Iits-sim-mah-kii" or Stabs Down. He wore a traditional white, tanned buckskin suit with hand-beaded trimming and a headdress he earned in 1984 in honor of his leadership role in his tribe. He rode a spotted black, white and gray appaloosa stallion from Wales, while a few other Natives danced on a central stage.Blackfeet Professor and Ten Other Natives Participate in Queen of England’s Diamond Jubilee PageantThe Diamond Jubilee focuses on seven major global regions, showcasing the culture from Great Britain (obviously), the Americas, ‘Australasia,’ Asia, the Middle East and Europe. The Americas portion included the Royal Canadian Mounted Police, Inuits who performed a demonstration of throat singing, drum dancing, and “the recreation of a polar bear hunt,” according to the language on the Jubilee’s site. And finally, they hosted “Native Americans, Cowboys and the Macfarlane Stagecoach, a representation of the American West of the mid 1800s including an authentic American stagecoach.”Comment: I'm glad they said Pepion earned his headdress. Otherwise I'd be wondering why a professor was wearing one. I hope the Indians weren't chasing the stagecoach on horseback. That would be stereotypical. For more on British royalty, see Prince Charles Meets Canadian Natives and Royals Meet Aboriginals. 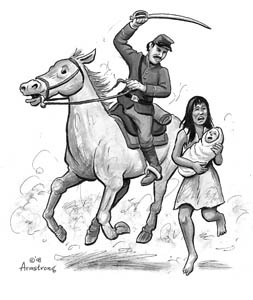 'Oaxaquita' (little Oaxacan) is used by other Mexicans to demean their indigenous compatriots—who are estimated to make up 30% of California's farmworkers. By Paloma EsquivelIndigenous Mexicans have come to the U.S. in increasing numbers in the last two decades. Some estimates now put them at 30% of California's farmworkers. In Ventura County, there are about 20,000 indigenous Mexicans, most of whom are Mixtec from the states of Oaxaca and Guerrero who work in the strawberry industry, according to local organizers. Many speak little or no Spanish and are frequently subjected to derision and ridicule from other Mexicans. The treatment follows a legacy of discrimination toward indigenous people in Mexico, said William Perez, a professor of education at Claremont Graduate University who has interviewed and surveyed numerous indigenous Mexican students. "One of the main themes is the discrimination, bullying, teasing and verbal abuse that they receive from other Mexican immigrant classmates who are not indigenous," he said. The abuse, which often goes unnoticed or is minimized by teachers and administrators, has left some of the indigenous students too embarrassed to speak their native languages, he said. Educators and others in the U.S. often don't recognize diversity within the Mexican community, said Gaspar Rivera-Salgado, a researcher at the UCLA Labor Center who has written extensively about indigenous Mexican migration. "We forget that it's a multilingual, multiethnic community," he said. "We forget about the fact that 62 indigenous languages are spoken in Mexico." The organizing project's campaign, Rivera-Salgado said, "is a really interesting way to confront, very directly, something that the Mexican nation and the Mexican immigrant community sometimes sweeps under the rug, and that's the prevalence of racism and discrimination that indigenous people have to endure in Mexico and that is reproduced here in the United States. "Comment: I wonder how much difference there is in the "blood" of indigenous and non-indigenous Mexicans. Is there any difference? Ironic to see Mexicans discriminate against each other. To many Americans, they're all one big brown horde. For more on the subject, see More Latinos Identify as Native and "Most Mexicans Are Indians." By Matthew BrownWestern lawmakers want to elevate the Plains bison to a status similar to that of the iconic bald eagle with legislation to declare the burly beasts America's "national mammal." Bison advocates launched a "vote bison" public relations campaign Friday to coincide with the bill. 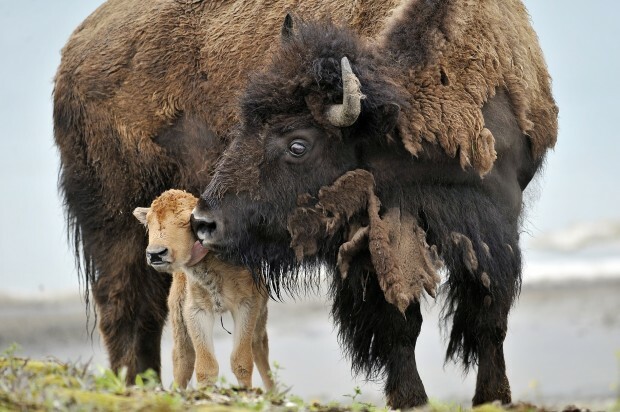 But supporters said the bison legacy bill would afford overdue recognition to a species that has sweeping cultural and ecological significance. Bison—North America's largest land animal—already appear on two state flags and the official seal of the U.S. Department of Interior. "The North American bison is an enduring symbol of America, its people and a way of life," said Wyoming Republican Sen. Mike Enzi, chief sponsor of the bill along with South Dakota Democratic Sen. Tim Johnson.Comment: For more on the buffalo, see White Buffalo the Play and $45,000 Reward for White Buffalo Killer. By Dan JonesWhich brings us to this recent hot-button topic: What’s wrong with Johnny Depp playing an Indian? Nothing now, because he is an American Indian. If the Comanche say it, then it is so. He has received some expert advice on Indians from none other than the political and cultural genius of LaDonna Harris. No one can argue with the fact a tribe has the right to determine who is an Indian. If the Comanche Nation wishes to adopt a space alien, it would not be in any tribe’s interest to criticize. Another tribe would only be limiting their own authority to do the same. From some of his statements, I don’t think Depp really knows enough about us to have come up with this brilliant way of eliminating all the questions about his being Indian. Again I take my hat off to Harris and the Comanche Nation for walking into the middle of what could have been a nasty long-term debate and putting an end to it. Johnny Depp is an Indian. Ponca leader thinks Depp is now a full-fledged Comanche citizen with voting rights, etc. Too bad there's no evidence of it. Unless the "adoption" makes him a Comanche citizen with voting rights, casino profits, etc., Depp still isn't an Indian. The key line in Jones's piece is:If the Comanche say it, then it is so.Which is my point. The Comanche tribe hasn't said it--at least not in the published reports. When the Comanche people, speaking through their duly elected government, declare Johnny Depp to be one of them, I'll concede the point. But LaDonna Harris isn't the Comanche people. As far as I know, she has no authority to make unilateral tribal membership decisions. And the Comanche government hasn't addressed the issue. Chairman's presence makes it official? This led to more discussion on Facebook:From what I've read, "In attendance were Comanche Nation Interim Tribal Chairman Johnny Wauqua, AIO’s staff and close family members." So, leadership was aware....The chairman's attendance doesn't change the point. I presume he doesn't have the power to unilaterally enroll people either. And no one has said he even participated in Harris's ceremony. It sounds to me like he merely observed it. "Leadership was aware" means the leadership thought it was nice that Harris was conducting her own personal ceremony and bringing good publicity to the tribe. That's not the same as legally ratifying her adoption and enrolling Depp as a tribal member. If the entire tribal council attended and had an ad hoc vote to ratify Harris's adoption, then you might have something. As far as I know, that didn't happen. Enrollment usually happens through a committee that examines a person's genealogy and then votes on whether to accept him or her. Right? As far as I know, most tribes don't allow individuals to bypass this process by hold adoption ceremonies for non-Indians. Or by waving magic wands over them. In conclusion, Jones is wrong. Until Depp is an enrolled member of the Comanche Nation, he isn't an Indian. He's still a white man with a small amount of Indian "blood." For more on the subject, see The Magical Power of Adoption and Questioning Depp's Comanche Adoption. By Mary CarmichaelUS Senate candidate Elizabeth Warren has said she was unaware that Harvard Law School had been promoting her purported Native American heritage until she read about it in a newspaper several weeks ago. The documents suggest for the first time that either Warren or a Harvard administrator classified her repeatedly as Native American in papers prepared for the government in a way that apparently did not adhere to federal diversity guidelines. They raise further questions about Warren’s statements that she was unaware Harvard was promoting her as Native American.And:In 1999, Harvard started publishing its full affirmative action plan on its website in the belief that it might be considered a public document. The report from that year lists one Native American senior professor at the entire university. A section devoted specifically to the law school also lists a single Native American senior professor, presumably the same one. Both entries specify that the professor is female. The Harvard document defines Native American as “a person having origins in any of the original peoples of North America and who maintains cultural identification through tribal affiliation or community recognition.” It notes that this definition is consistent with federal regulations. It is not a definition Warren appears to fit. She has not proven she has a Native American ancestor, instead saying she based her belief on family lore, and she has no official tribal affiliation. The current executive director of Harvard’s Native American program has said she has no memory of Warren participating in any of its activities. Harvard continued to publish its affirmative action plans online in 2000, 2001, 2002, 2003, and 2004. The school has analogous documents for the other years during Warren’s tenure, but has not published them online.Comment: It's looking more and more like Warren engaged in box-checking. It wouldn't be a crime or even a major ethics violation--more of a minor one. But still, this is the same issue as Johnny Depp or Taylor Lautner taking an acting job based on rumors of Native heritage. It's wrong in those cases and it's wrong if Warren did it too. 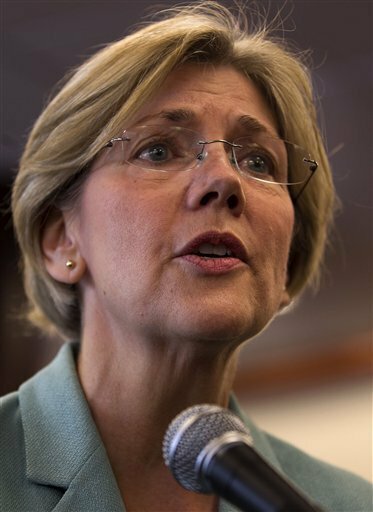 Warren's and Harvard's refusal to answer questions only feeds the flames. They're trying to have it both ways: "We did nothing wrong, but we won't release the data or talk about it." Anyone who takes that attitude deserves to be questioned about it. For more on the subject, see Box-Checking Is Unethical and Did Warren Check "Native" to Get Job? By Chuck HagaWhile the trend nationally has been for prep and collegiate sports teams to move away from American Indian-themed nicknames and logos, the new North American Hockey League Junior A team in Johnstown, Pa., announced Wednesday that it will be known as the Tomahawks. The new logo, also unveiled Wednesday, is an Indian head over a crossed pair of cut-stone tomahawks. Johnstown and its War Memorial Arena provided the setting for the classic 1977 movie “Slapshot” starring Paul Newman. The city was host to a NAHL team called the Johnstown Chiefs for 20 years until it moved to Greenville, S.C., in 2010. The new name and logo provide links to the Chiefs, according to a statement from the team’s owners, who said they also chose “Tomahawks” and an Indian head logo “to symbolize the new team’s fighting spirit, exciting style of play and good sportsmanship,” according to a regional TV station’s report. Thursday’s front page of the Johnstown Tribune-Democrat carried a photo of team captain Jason Spence wearing a jersey with the new logo. The story was headlined, “Back on the warpath.”And:Eric Knopsnyder, web and multimedia editor for the Tribune-Democrat, covered the news conference. In a telephone interview, he said nobody asked whether the team had discussed the possibility of reaction against the use of American Indian imagery in the team name and logo. “Nobody brought it up,” he said. There was no indication the new team owners planned to revive the Tommy Hawk mascot.A member of the Spirit Lake Sioux Tribe stated the obvious:“Racism against Native American appears to run deeper than it does with other minorities,” Longie said. 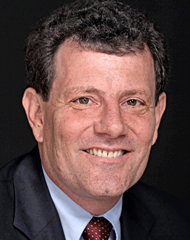 “That could be because we are the least politically powerful. No one would consider using a mascot that represents black or Hispanic people. On its Facebook page, F.A.I.R. (For Accurate Indigenous Representation) posted the following:We are NOT cool with this. Talk about going backwards. This North American Hockey Junior A team has just adopted a racist team name, logo, and all that goes with it. We're going to ask our members to step up and be heard on this one. North American Hockey League Junior A team in Johnstown, Pa., announced that it will be known as the Tomahawks. They are in violation of the United Nations Declaration on The Rights of Indigenous Peoples. Articles 15 and 31. The U.S.A. is a signatory to this international Treaty. "The Tomahawks’ first president, Rick Bouchard, is a UND graduate who played basketball for Coach Dave Gunther’s Sioux basketball teams in the late 1970s. His brother, Jim, is majority owner of the Tier II Junior A franchise." JohnstownTomahawks.comComment: Hard to believe that someone would choose an Indian mascot these days. This one tops the Fighting Sioux mascot in terms of being offensive and racist. Not surprisingly, the owners are graduates of UND, home of the Fighting Sioux. 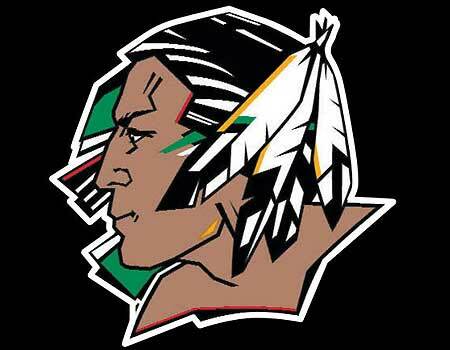 It's pretty clearly they based their logo on the Fighting Sioux logo. No doubt they're trying to keep the "savage Indian" concept alive. And sending a message about how they won't buckle to political pressure. For more on Indian mascots, see Oregon Bans Indian Mascots and NCAA Punishes UND for "Fighting Sioux." Tribe Disapproves of Oregon Banning Native MascotsOne of the 15 schools affected by the Oregon Board of Education’s decision to ban Native American mascots is Siletz Valley School, an Indian charter school whose mascot is the Siletz Warrior, an Indian in a headdress, which will now have to change. And the Confederated Tribe of Siletz Indians—one of 10 federally recognized tribes in Oregon—issued a statement Tuesday, May 22 expressing its disappointment with the board’s decision to ban the mascots. “It is the opinion of the Siletz Tribe that this ban does nothing to address the real issues of racism nor does it address the issue of the low self-esteem of Native students attending public schools,” the statement from the tribe said. “For the Siletz Tribal community, this action has a negative impact on our students and our community. We will be forced once again to succumb to the misguided intentions of people who have no knowledge of Indian communities.”And:The Register-Guard reported on May 23 that it’s unclear whether the Oregon Board of Education will be able to enforce the ban on tribal land though. The Guard also reported that other tribes in the state including the Confederated Tribes of the Coos, Lower Umpqua and Siuslaw Indians support the ban. Their tribal chairman, Bob Garcia, told The Guard, “If it’s the Siletz Warriors, run by the Siletz Tribe, I don’t have a problem with that.”Comment: Hundreds of tribes and tribal organizations have come out against Indian mascots. Including some in Oregon. In other words, many mascot foes are Indians. The idea that they don't know "Indian communities" is a crock. If the Siletz Valley School is under public administration, I don't care if it's on tribal land. The stereotypical mascot should go. A Plains chief in Oregon is stupid and ignorant whether the purveyor is Native or not. But if the school is under tribal administration, let the ignorant Indians keep their stereotypical chief. If they want to portray themselves as primitive people of the past, not modern-day participants in American society, that's their right. No matter how foolish a choice it may be. For more on the subject, see Oregon Bans Indian Mascots and Team Names and Mascots.